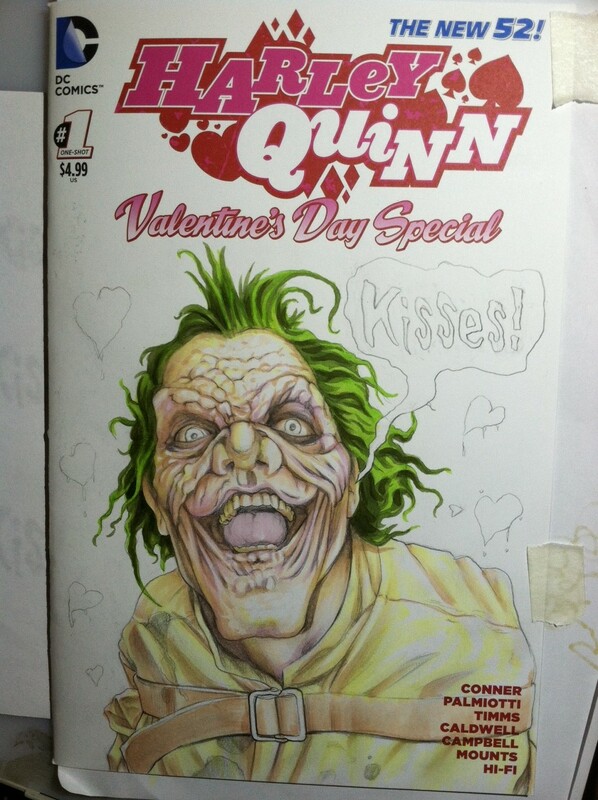 “Things are a bit sketchy as I draw a blank!” Drawing on blank comic book sketch covers for fun and profit. Hey gang- things have gotten a bit sketchy for me lately, but in a good way. 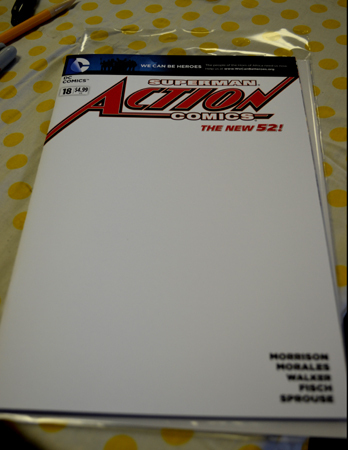 If you’re a comic book collector you’ve probably noticed an occasional comic book on the shelves that has a blank cover. No, it’s not a printing mistake, a blizzard illustration, or a picture of a cow eating grass (“Where’s the cow?” “He ate all the grass and left!”). In fact, it’s meant not to have anything on it other than the title of the book (logo/masthead) and other info like creator credits, issue number, and prince. 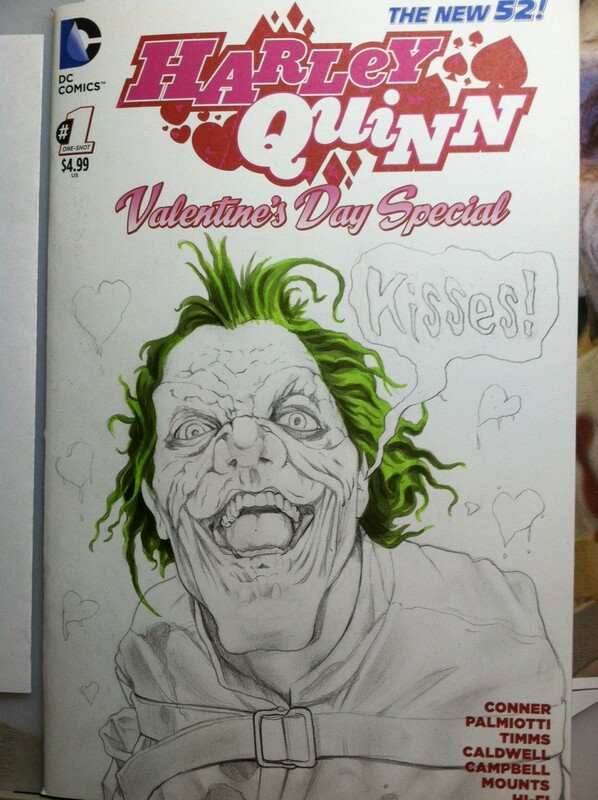 They are blank sketch cover variant issues. Normally they are the same cover price as a comic with a printed cover, but they can be more expensive than the regular cover, or less than a variant cover. What makes them valuable is what is or can be done to them. 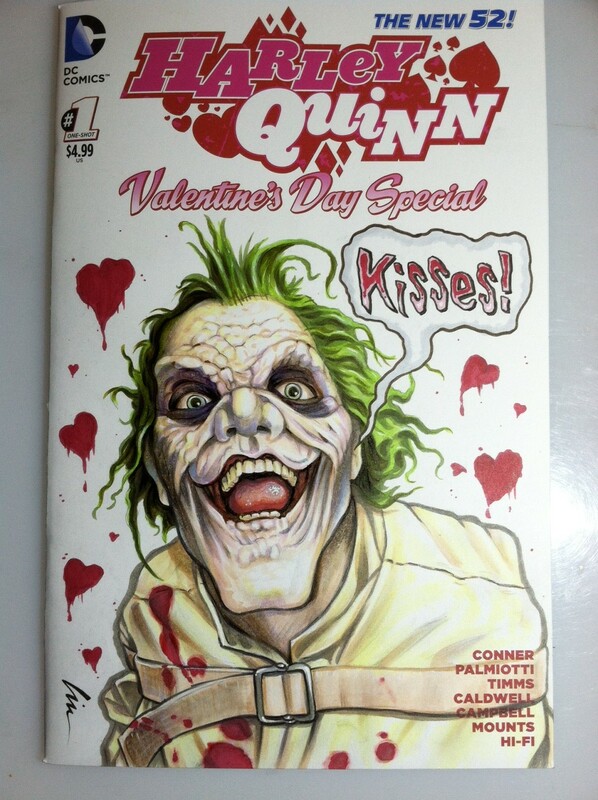 Some sketch covers go for a few dollars, others for hundreds of dollars or more depending on the artist and subject drawn on them. 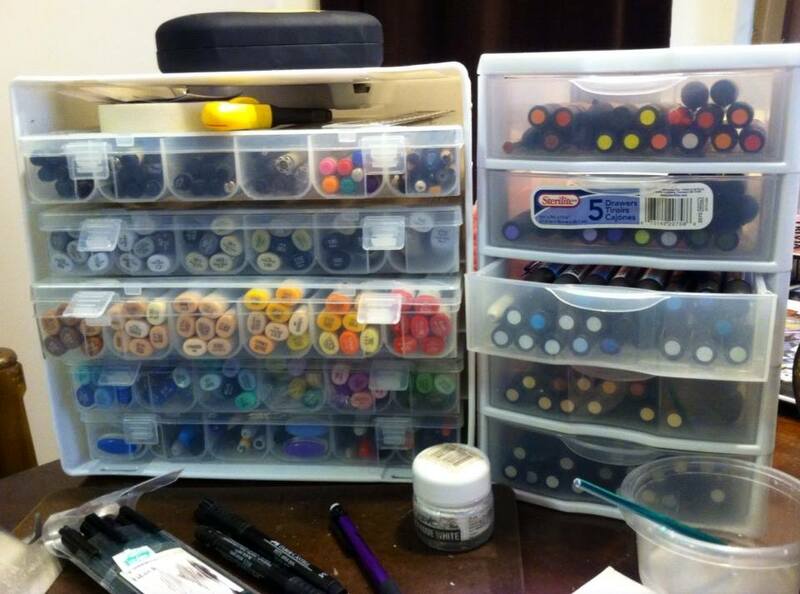 I’ve been picking up some whenever I can and stockpiling them for a rainy day (or like this week, an icy day) when I could sit in my Batcave studio and draw on them. Sometimes they are easier to acquire- sometimes pretty rare. 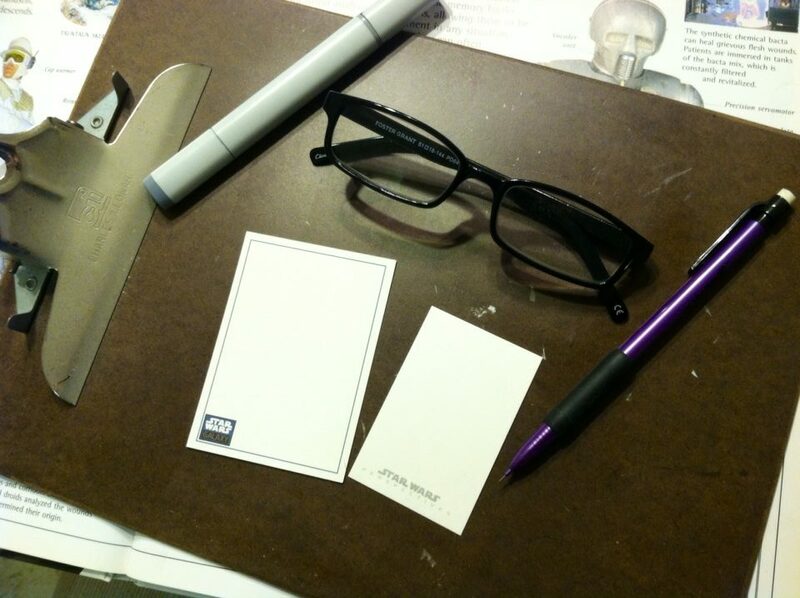 The cover stock is kind of a Bristol type of paper and can vary a bit in thickness and finish. 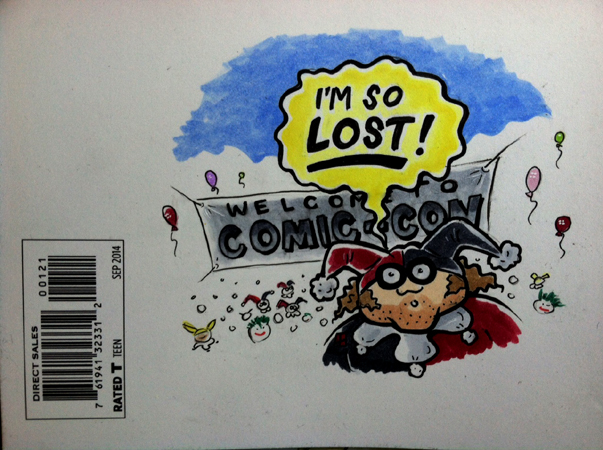 They are a lot like the sketchcards I do, only bigger, and two sided. 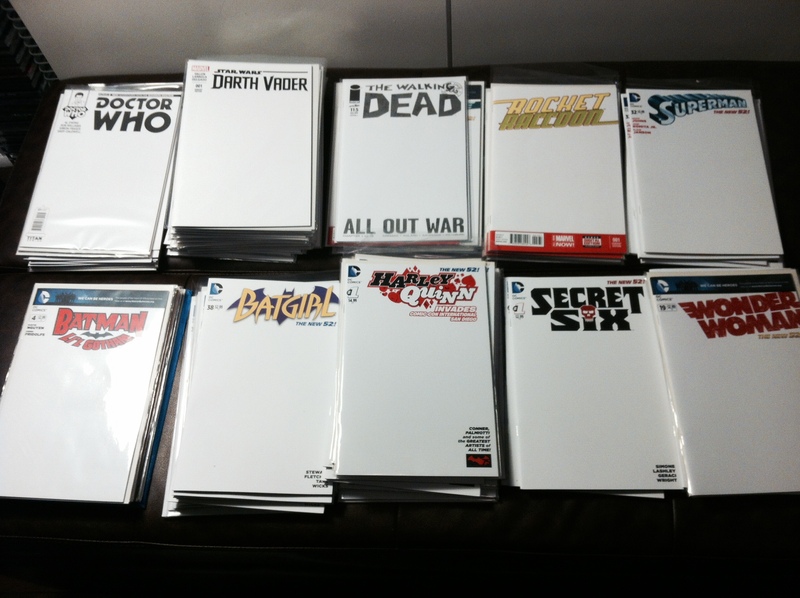 I’ve got some DC issues, some Marvel, some Doctor Who, Mars Attacks, The Walking Dead, Star Wars, and more…a lot more! 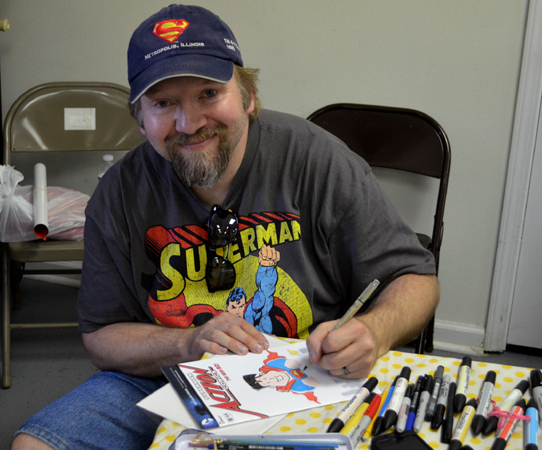 I was first asked to draw on a sketch cover when I was up in Metropolis, IL for the 2013 Superman Celebration. 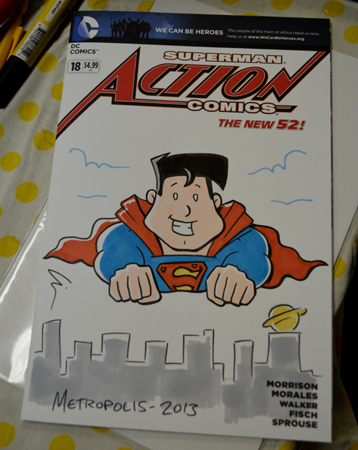 I wasn’t set up as a guest at the show that year, just visiting and hanging out in “Artists Alley/Writers Way” when I was asked if I’d like to draw on an Action Comics one for charity to go into the auction that night. Since I hadn’t done one before, and it sounded like a lot of fun- I agreed to do one. I was right- it was fun! This week while I was home from my day job thanks to an ice storm I got one of my blank comic covers, pulled out my markers and a pencil, and printed out a reference photo of the Joker. It’s an image I’ve been wanting to do as a marker sketch and/or painting. It’s actually a photo I shot of an incredible Joker cosplayer at the San Diego Comic Con back in 2008. I was walking the con floor when I saw him approaching. As he was passing by I asked if I could take his photo. He turned and said, “Sure!” as he got right in my face- scared the crap outta me! I snapped the pic but didn’t have time to take an insurance shot because “the Joker got away!”- the guy was quick for someone wearing a straightjacket! 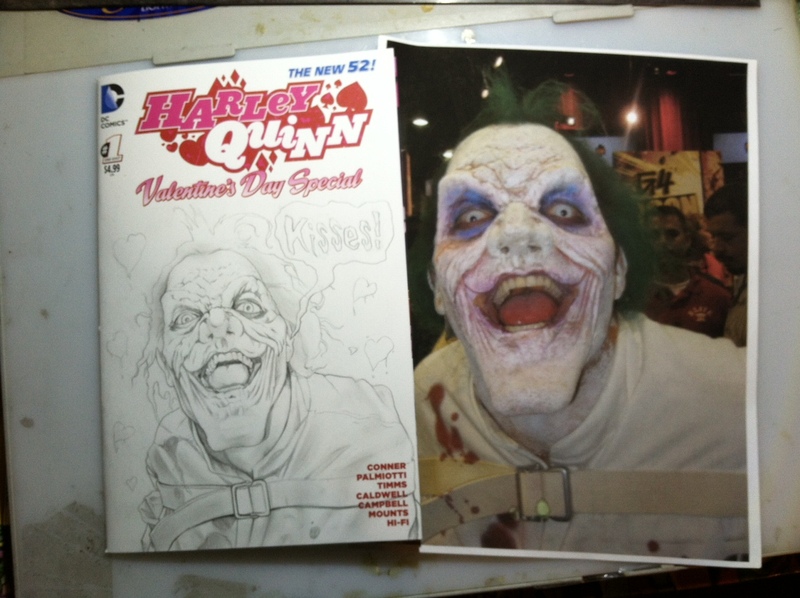 Luckily for me I did “capture” the Joker’s image. I started off drawing the Joker out in pencil. I then got my trays of Copic markers and after putting a blanks sheet of paper to help block marker bleed, I started working his trademark green hair. I then started working in the pinks, grays, purples, and blues into the flesh-tones, along with some yellow and beige as I started working the straightjacket. 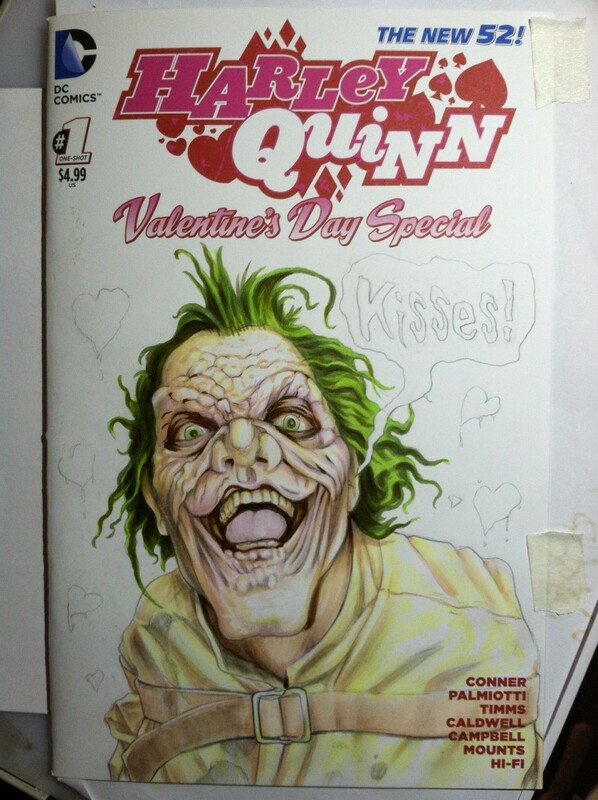 Finished up the front cover with red Copic markers for the mouth, hearts, and blood- did a little bit of detailing with a black Micron pen (03), a white Gelly Roll pen, and a white Primacolor pencil, too. 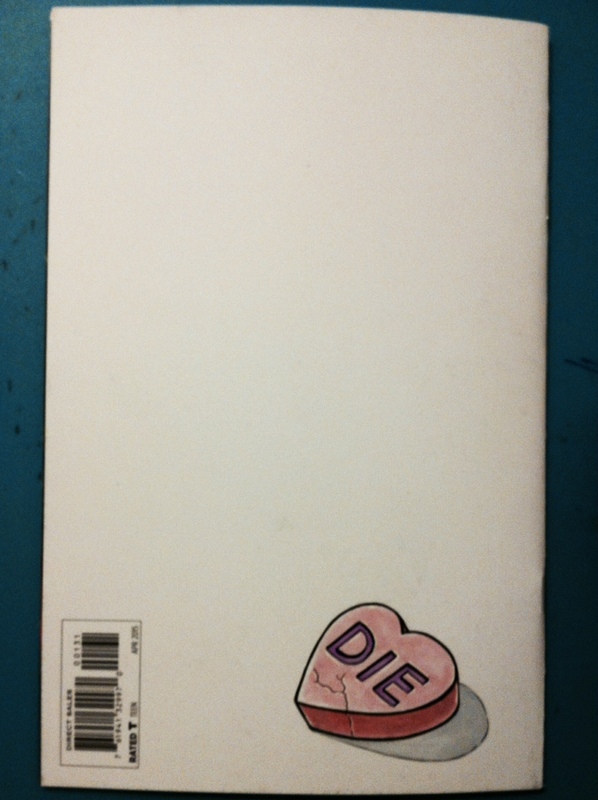 Didn’t want to leave the back cover blank, so I added a Valentine heart candy to the lower corner (while watching the TV show “Face Off” which is kinda ironic- Joker/face off, get it..?). Once I had finished each side I protected the art with a spray fixative. 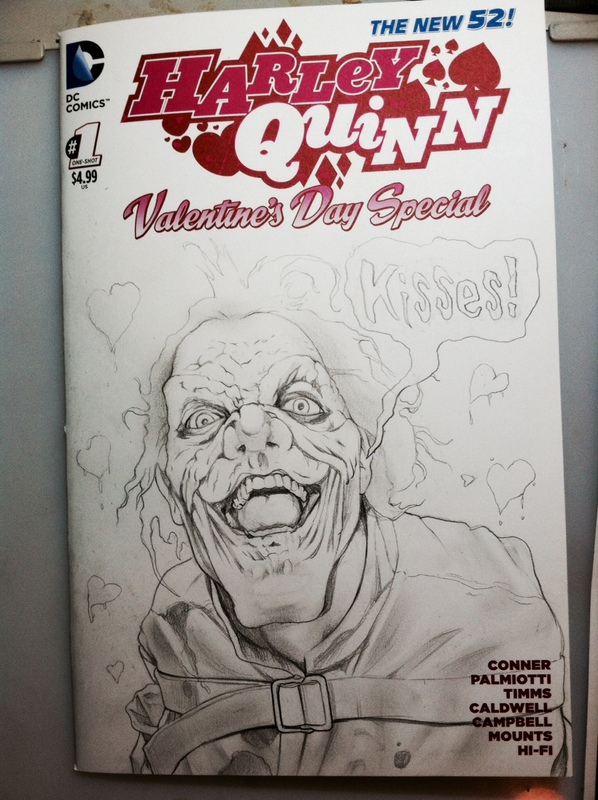 Since the weather was bad and I got off work a bit earlier than I thought this weekend I did another Harley Quinn cover. 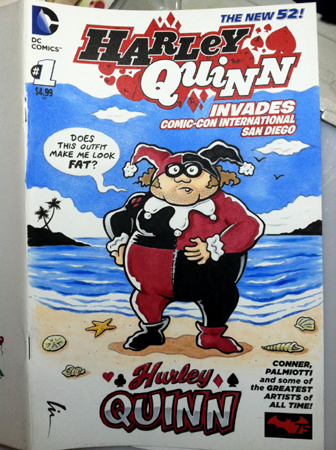 This time a Harley Quin Invades Comic-Con International San Diego #1 issue. It’s based on a sketch I did at the Phoenix Comicon a few years back in their “Quick Draw” sketch panel. 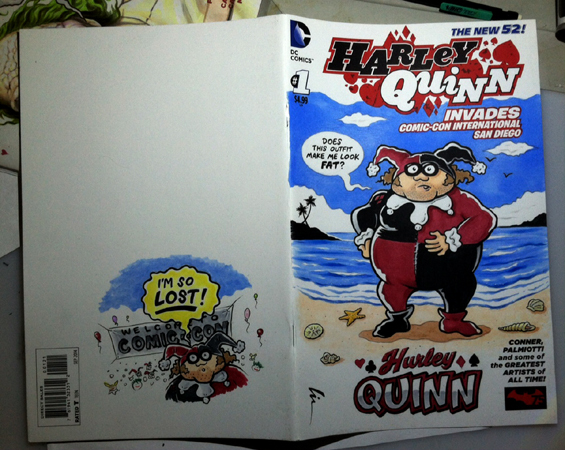 I mis-heard “Harley Quinn” as “Hurley Quinn”. Really had a fun time working on these covers and look forward to doing more as time allows. Will have finished ones on my site and available for sale at upcoming shows like Midsouthcon (in Pro-Row) next month, and at my tables at the Memphis Comic Expo and Con Kasterborous this summer. More sketchy details to come!